Three roads lead out of Chora Sfakion. One of these heads westwards up a winding road for 12 km to the mountain village of Anopoli. It is also possible to walk to Anopoli from Chora Sfakion up the old mule-track which takes a much more direct and attractive route than the road. The large village of Anapoli (actually a collection of small villages) occupies a plateau at the foot of the White Mountains (Lefka Ori), and it is much cooler up here than down on the coast. The village is not visible from the sea, which was a source of security in former times. In the centre of the village stands a statue of the local Cretan hero of the resistance against the Turks, Daskalogiannis “Teacher John”. There are tavernas, rooms and bakeries in the the village, and the local cheese and yoghurt are delicious. From Anopoli, it is possible to walk down a winding footpath to Loutro. Aradena is famous for the old church of St. Efstratios, which contains wonderful wall paintings from the 14th century but unfortunately is locked. Most of the population left Aradena in the late 1940s as a result of a vendetta. Peering into the ruins, hearing the sound of only birds and sheep bells, and wandering through the ancient olive trees makes for a magical trip. For centuries, Aradena was protected by the Aradena gorge. The only way from Anopoli to Aradena was on foot or by mule, down the Roman footpath (which is still clearly visible and quite well preserved) to the bottom of the gorge and then up the other side. Now, however, the road crosses the ravine on a bridge built in Britain and donated by the Sfakian benefactor Vardinogiannis. During the main season there is a small kiosk by the bridge which sells drinks and some light refreshments. It is possible to walk down this stunning gorge which comes out on the coast at Marmara Beach; from there you can walk back to Loutro. The gorge has a 30ft. drop at one place, but there is a ladder as well as a new path cut around the drop. Agios Giannis (St. John) lies at the end of the road about 5 km west of Aradena. From this remote village there are no roads further west, in spite of what some maps may indicate. You either have to return to way you came or continue on foot. The footpath, which starts just before the gate to the village and the taverna (open only in the summer), leads after about an hour to a cliff from where there are magnificent views down to Agia Roumeli. The footpath, very rough in places, winds down to the shore, where it meets up with the Loutro-Roumeli path to the east of Agios Pavlos. The ferry that goes from Chora Sfakion to Loutro continues westwards to Agia Roumeli (1 hour), taking in views of the spectacularly rugged coastline. This village lies at the bottom of the Samaria gorge. On a day trip from Chora Sfakion, there is time to walk part way up the gorge to the narrow Iron Gates and the old village of Samaria. At the height of the season, Agia Roumeli can be very busy in the late afternoon, when people who have walked all the way down the gorge wait for the ferries to take them to Chora Sfakion. It is also possible to walk from Loutro to Agia Roumeli along a path which takes you to the ancient seaside church of Agios Pavlos, where St. Paul is said to have first landed on his visit to Crete. Heading north from Imbros, a turning to the right takes you up a steep but well-surfaced road and then down again to Asfendou. This village was destroyed by the Nazies as a reprisal during WWII, but a number of interesting old houses remain. Note that the village is inhabited only in the summer and there are no tavernas in Asfendou. You can walk down the peaceful Asfendou gorge on an old footpath to Agios Nektarios on the coast road. From Asfendou, a new road continues to the plateau village of Kallikratis, where there is a taverna. From there, the road continues to the north coast. There is also a very rough dirt road, suitable for jeeps and pick-ups only, which goes down to Patsianos on the southern coastal road. The old footpath down the Kallikratis gorge to Patsianos, which is signposted off this dirt road, is peaceful and has stunning views. The third road out of Chora Sfakion leads east along the coast. This takes you through the typical small Sfakian villages of Comitades with several tavernas, Vraskas, Vouvas, Nomikiana, Agios Nektarious, Patsianos, Kapsodasos, Skaloti, and Argoules before leaving Sfakia. A turning to the right after Agios Nektarios leads to Frangokastello, the castle of the Franks, i.e. the Venetians. This castle was a stronghold of the Venetians during their occupation of the island (1204-1669), and the emblem of the lion of St. Mark can still be seen above the portals. Frangokastello lies on a flat, windy plain that was not inhabited until very recently. It now boasts a lot of tourist accommodation, a number of shops and tavernas, and sandy beaches. The second road out of Chora Sfakion is the one by which most tourists arrive in the area. This makes the steep ascent from sea-level northwards towards Chania. The first village you come to is Imbros (also known as Nimbros). This is the starting-point for the relatively easy walk down the Imbros gorge (a small fee is charged at the entrace), with its fascinating rock faces in the narrow parts, to Comitades. This was the route followed by the British army in WWII in their retreat to Chora Sfakion, from where they were either evacuated or captured. Imbros has several good tavernas. After Imbros, you come to the large plateau at Askifou, which is an important agricultural centre for the region. It also has tavernas, bakeries, and a petrol station. From here it is possible to walk south across the plateau, via Goni, to Asfendou. Three roads lead out of Chora Sfakion. One of these heads westwards up a winding road for 12 km to the mountain village of Anopoli. It is also possible to walk to Anopoli from Chora Sfakion up the old mule-track which takes a much more direct and attractive route than the road. The large village of Anapoli (actually a collection of small villages) occupies a plateau at the foot of the White Mountains (Lefka Ori), and it is much cooler up here than down on the coast. The village is not visible from the sea, which was a source of security in former times. 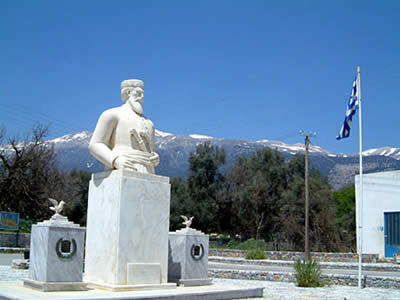 In the centre of the village stands a statue of the local Cretan hero of the resistance against the Turks, Daskalogiannis ? “Teacher John”. There are tavernas, rooms and bakeries in the the village, and the local cheese and yoghurt are delicious. From Anopoli, it is possible to walk down a winding footpath to Loutro. The road from Anopoli continues westwards towards the ancient but now almost deserted village of Aradena. (Before you reach Aradena, there is a dirt road to the left which leads to Livaniana, and then to the paths for Phoenix and Loutro.) Aradena is famous for the old church of St. Efstratios, which contains wonderful wall paintings from the 14th century but unfortunately is locked. Most of the population left Aradena in the late 1940s as a result of a vendetta. Peering into the ruins, hearing the sound of only birds and sheep bells, and wandering through the ancient olive trees makes for a magical trip. For centuries, Aradena was protected by the Aradena gorge. The only way from Anopoli to Aradena was on foot or by mule, down the Roman footpath (which is still clearly visible and quite well preserved) to the bottom of the gorge and then up the other side. Now, however, the road crosses the ravine on a bridge built in Britain and donated by the Sfakian benefactor Vardinogiannis. During the main season there is a small kiosk by the bridge which sells drinks and some light refreshments. It is possible to walk down this stunning gorge (see WALKS link), which comes out on the coast at Marmara Beach; from there you can walk back to Loutro. The gorge has a 30ft. drop at one place, but there is a ladder as well as a new path cut around the drop. Agios Giannis (St. John) lies at the end of the road about 5 km west of Aradena. From this remote village there are no roads further west, in spite of what some maps may indicate. You either have to return to way you came or continue on foot. The footpath, which starts just before the gate to the village and the taverna (open only in the summer), leads after about an hour to a cliff from where there are magnificent views down to Agia Roumeli. The footpath, very rough in places, winds down to the shore, where it meets up with the Loutro-Roumeli path to the east of Agios Pavlos. On a day trip from Chora Sfakion, there is time to walk part way up the gorge to the narrow ?iron gates? and the old village of Samaria. At the height of the season, Agia Roumeli can be very busy in the late afternoon, when people who have walked all the way down the gorge wait for the ferries to take them to Chora Sfakion. It is also possible to walk from Loutro to Agia Roumeli along a path which takes you to the ancient seaside church of Agios Pavlos, where St. Paul is said to have first landed on his visit to Crete. Heading north from Imbros, a turning to the right takes you up a steep but well-surfaced road and then down again to Asfendou. This village was destroyed by the Nazies as a reprisal during WWII, but a number of interesting old houses remain. . Note that the village is inhabited only in the summer and there are no tavernas in Asfendou, so few people pass through here. You can walk down the beautiful and peaceful Asfendou gorge on an old footpath to Agios Nektarios on the coast road. From Asfendou, a new road continues to the plateau village of Kallikratis, where there is a taverna. From there, the road continues to the north coast. There is also a very rough dirt road, suitable for jeeps and pick-ups only, which goes down to Patsianos on the southern coastal road. The old footpath down the Kallikratis gorge to Patsianos, which is signposted off this dirt road, is peaceful and has stunning views. The third road out of Chora Sfakion leads east along the coast. This takes you through the typical small Sfakian villages of Comitades (with several tavernas), Vraskas, Vouvas, Nomikiana, Agios Nektarious, Patsianos, Kapsodasos, Skaloti, and Argoules before leaving Sfakia. A turning to the right after Agios Nektarios leads to Frangokastello, ?the castle of the Franks?, i.e. the Venetians. This castle was a stronghold of the Venetians during their occupation of the island (1204-1669), and the emblem of the lion of St. Mark can still be seen above the portals. Frangokastello lies on a flat, windy plain that was not inhabited until very recently. It now boasts a lot of tourist accommodation, a number of shops and tavernas, and sandy beaches. This is the starting-point for the relatively easy walk down the Imbros gorge (a small fee is charged at the entrace), with its fascinating rock faces in the narrow parts, to Comitades (see WALKS link). This was the route followed by the British army in WWII in their retreat to Chora Sfakion, from where they were either evacuated or captured. Imbros has several good tavernas. People in Comitades will drive you back up to Imbros for a fee. After Imbros, you come to the large plateau at Askifou, which is an important agricultural centre for the region. It also has tavernas, bakeries, and a petrol station. From here it is possible to walk south across the plateau, via Goni, to Asfendou.